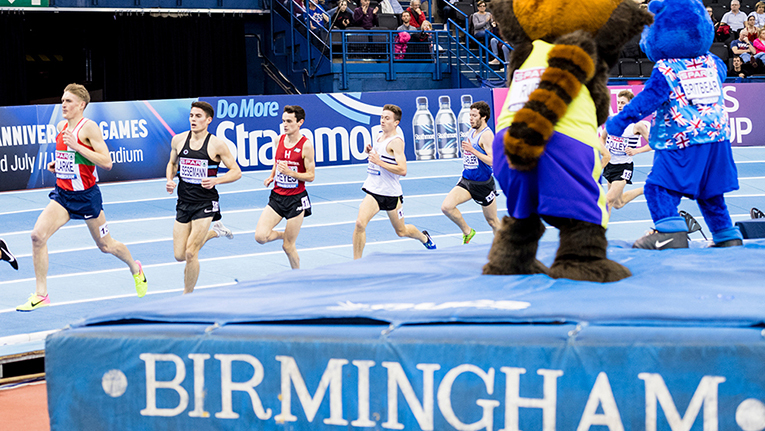 The men's 3000m final at the British Athletics Indoor Championships and World Trials at Birmingham, UK, on 18 February 2018. The race was won by Andrew Heyes (third from left) in a time of 7:54.81. 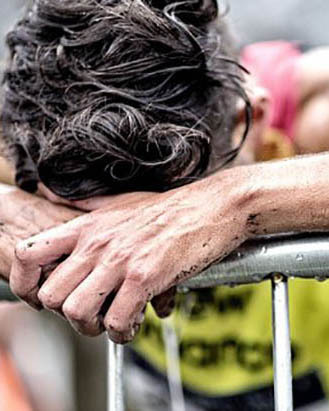 With conditions on the roads worsening, race cancellations stacking up and Birmingham looking more like the Antarctic than the West Midlands, even shorts-in-all-weathers types will be watching on with a hint of envy at those racing under cover. Home advantage for the Brits in action will add spice to proceedings. Expectant crowds and sycophantic BBC coverage will provide some distraction from Storm Emma swirling outside. Here are four Brits we think may just pull off something a little extraordinary in Birmingham this weekend. With the likes of Hellen Obiri, Genzebe Dibaba and Sifan Hassan in the field, the devastating kick that left everyone jogging in her wake at the British Champs will come in handy this weekend. Laura is almost unmatched for pace-changing ability. While she’ll likely be found in her preferred spot at the head of the field at some point, she needs to still be in contention when the fireworks start. The 1500m will be another kettle of fish altogether – but such is her calibre that she will be able to keep pace with the best. Sitting pretty at the top of the UK indoor 3,000m rankings and with a cool 1.59 over 800m already this year, the double-European indoor champion is within touching distance of some global silverware. Eilish McColgan is made of stern stuff. Two medals bagged at the British Indoor Championships demonstrate that and much more. Coming just a few days after illness and a few weeks ahead of the Commonwealth Games, the commitment to compete and tick the boxes set out in the selection criteria is much that absent Brits should take note of. That Eilish was under the weather yet committed and still achieved her objectives is testament to the training put in this winter. A fully fit Eilish may prove more of a match for Laura Muir this weekend, devastating kick and all. Tackling both championships – let alone two events – is beyond some this weekend, who already have half an eye on the Euros to come later this year. This weekend is stepping stone to the Gold Coast. It’s the sharpener Eilish will need to compete and medal in a few weeks – especially given she’ll be leading the way and out of her compatriot’s shadow. Just 11 men started the 1500m at the British Champs two weeks ago. From rounds to a straight-final, the far-from grand total was one inside the minimum required to force the athletes through the rounds. Disappointing? Yes. But the race itself wasn’t lacking. While going through the rounds would have offered a greater test of speed-endurance, the luxury of a straight final probably didn’t affect the eventual outcome. A potentially cagey affair was made much the more honest by eventual bronze medalist Tom Marshall. But seeing Jake Wightman grab the reins late on came as little surprise. Confident, strident, dominant. Jake held off Charlie Grice with comfort, his finishing kick proving to be in excellent order. Jake’s a racer. His third place over 800m in Glasgow last weekend ahead of Kyle Langford proof enough of his talent. Translating that to finals in major champs should now be the ambition. His selection may have come courtesy of home nation discretion, but Elliot Giles is undoubtedly the classiest runner Britain has over 800m. His maiden national indoor title over 1500m last year was followed up this time by a straightforward win over his more accustomed distance. The manner of his win two weeks ago was authoritative – if ultimately unsurprising. The sit-and-kick tactic employed in the final was a carbon copy of the heat. If his rivals this weekend have any nous about them then they’ll know not to lead the race out and allow Elliot to follow. Two years on from his breakthrough bronze at the European Athletics Outdoor Championships, the Birchfield man underdelivered at the world championships last summer. It was something of a missed opportunity, especially given the way the final played out.